Download Bamboo and run the Setup Wizard. 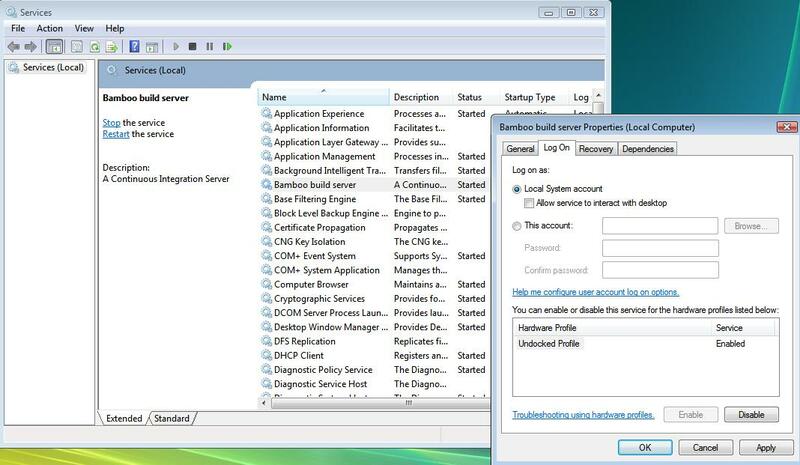 Install Bamboo as Windows service, as described in Running Bamboo as a Windows service. 2. Edit the Bamboo service to run as the "local user"
Go to Start -> Run and enter 'services.msc'. The 'Services' window will display (see screenshot below). Double-click the 'Bamboo build server' row. The 'Bamboo build server Properties' window will display (see screenshot above). Select the 'This account' option, provide a local admin account credentials, and click the 'OK' button to apply your changes. 3. Give the local user access to "logon as a service"
The 'Local Security Settings' window will display. Expand the 'Local Policies' tree and click 'User Rights Assignment'. Scroll down and find the 'Logon As a Service' Policy (see screenshot below). Double-click the 'Log on as a service' policy. The properties window for the 'Log on as a service' policy will display (see screenshot below). Click the 'Add User or Group' button. The 'Select Users or Groups' window will display (see screenshot above). Enter your local user and click 'OK' to allow your user to "logon as a service". Click 'OK' and close all open windows. Bamboo will now start as service, under the local user.